Assistant boss Dean Austin believes the Cobblers have the ‘qualities’ to overcome the ‘challenges’ Blackpool will pose when the two sides clash in Sky Bet League One on Saturday - weather permitting. There is a pitch inspection planned at Bloomfield Road on Friday morning, but if the game is given the go-ahead Town travel to the north west coast defending an unbeaten away record in 2018, having claimed wins over Bradford City and AFC Wimbledon and draws at Blackburn Rovers and Scunthorpe United. It’s an impressive record the team is keen to maintain this weekend, and although Austin knows it won’t be easy, he has confidence Town can return with some reward. “Every single game in this division will give us a different set of challenges, and on Saturday, Blackpool will present us with another set of challenges,” said Austin, stepping in to do media duties as manager Jimmy Floyd Hasselbaink was on a UEFA A coaching course. “It is a smaller pitch, and not a very good pitch, one not really conducive to free-flowing football, so it is going to be a tough game. “Blackpool have had a little upturn in form, they have had a couple of really good wins, so make no bones about it, it is going to be a very, very tough game for us. The Cobblers certainly need a positive result after a run of three games where they have picked up just two points from a possible nine. 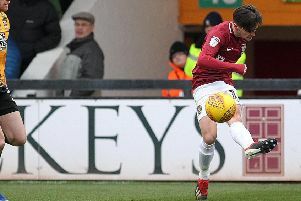 Last Saturday’s 0-0 draw with Oxford United at Sixfields was a big improvement on the previous home game, a 2-1 loss to Gillingham, but there was still frustration among the supporters. There were loud boos as Hasselbaink took off winger Gboly Ariyibi, and more discontent at the end as another chance to ease away from the bottom four went begging. Hasselbaink was not happy with the fans’ reaction, and said so afterwards, and although Austin agrees supporters’ negativity is never helpful, he says it is just part of the game. “I don’t take a lot of notice of it,” said Austin, a former player with Tottenham Hotspur and Crystal Palace. “It is normal, it’s football. “If you are winning games of football then everybody is happy, if you’re not winning games everybody is unhappy. “You have to take the rough with the smooth, and it’s really not an issue. “I didn’t really hear it if I am honest, and when I am concentrating on the game I have always been one of those, even when I was a player, I never took much notice of what was going on on the outside. “I am always focused on the job, but if that was going on, and it did go on, then it is obviously frustrating and it’s not going to help the player, that’s for sure.